The feared telegram - "Regret to inform you..."
There came a sudden loud clattering at the front door knocker that always meant a telegram. For a moment I thought that my legs would not carry me, but they behaved quite normally as I got up and went to the door. I knew what was in the telegram - I had known for a week - but because the persistent hopefulness of the human heart refuses to allow intuitive certainty to persuade the reason of that which it knows, I opened and read it in a tearing anguish of suspense. 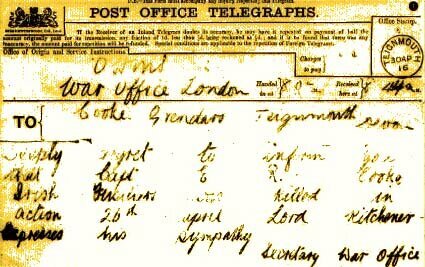 "Regret to inform you Captain E.H. Brittain, MC, killed in action Italy June 15th"
"No answer," I told the boy mechanically, and handed the telegram to my father, who had followed me into the hall. As we went back into the dining-room I saw, as though I had never seen them before, the bowl of blue delphiniums on the table; their intense colour, vivid, ethereal, seemed too radiant for earthly flowers. Click on the picture to see the next in this series or click here to go back to the summary page.